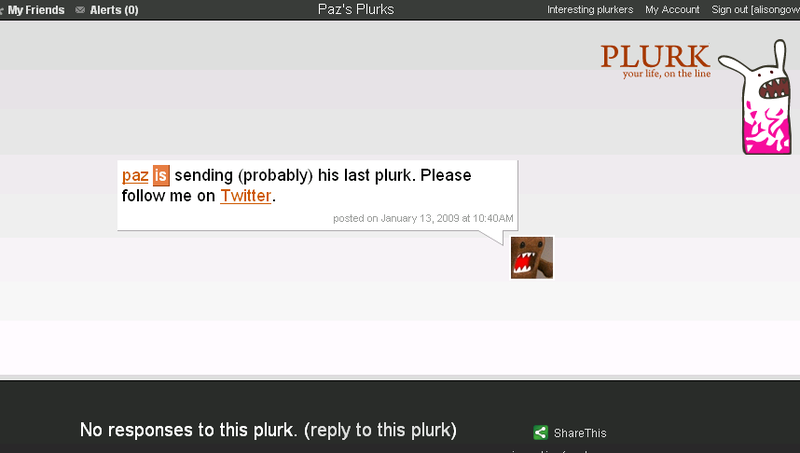 I signed up to Plurk, the quirky microblog that allows threaded conversations, shared photos, links and videos, more or less at its launch and I’ve been a staunch supporter ever since, despite the fact that it’s a rather odd looking beast. But lately Plurk has gone into a decline, and now it seems as though it’s really starting to fail in earnest. Last week a Plurk friend, Rob, became the latest user I’ve seen to question its problems. On his blog he asked the question Plurk No Growing. Why? on his blog and polled whether it was Plurk’s ‘karma’ gimmick that was holding it back (66% said it was a turn-off). Others complain “Plurk is too time consuming w/ the web interface”, “Lack of promotion”, and “as nice as threaded conversations are in theory, in practice, they don’t really work in a Plurk/Twitter-like service”. I know some people get seriously annoyed when their kama falls(and consequently their emoticons are reduced) when they fail to use Plurk for a day or so but I’m not sure it should shoulder the full blame for what seems to be this site’s slow death. … is the very thing that everyone got excited about in the first place… the ability to hold threaded conversations. I have a small core of Plurk mates and a wider circle of friends whose conversations I dip in and out of. I steer clear of threads that I know are just going to get nasty (anything regarding Israel at the moment) as what starts out as a reasoned debate always – and I mean always – descends into open hostility. Likewise, people who once got perhaps 135 responses for saying ‘morning Plurk’ and now get perhaps 10 (probably because there are so many users saying ‘morning’ it’s frankly boring to respond to everyone) and then post disgrunted messages about how the service has deteriorated. Finally, Plurk has been incredibly buggy lately; messages post twice or not at all, the timeline works sporadically and is still not searchable, and it all feels a bit clunky. I’m still using it right now but it feels like it’s withering on the vine. For an online social network that had such promise, it now feels like it’s in a terminal decline. A lot of people I know are scaling back on where they are online because they just don’t have the time to mingle as much – personal blogs, Twitter and Facebook seem to be the winners at the cost of others. That’s true – I started using Tumblr and then it petered out. Things have to hold our attention I guess. I wonder if today’s Jaiku announcement will impact on use of other networks or not. I know a lot of people wanted Jaiku invites when Twitter went Fail Whale crazy last year, but they returned as soon as the problems were over. With a finite amount of time, maybe we all find it easier to build on our existing networks, than start trying to create new ones from scratch. Sorry I hadn’t noticed this post sooner. To be honest Plurk is almost dying out — karma is a true turn-off, and the website often behaves erratically. The site lacks polish in many aspects, and the devs aren’t releasing the API yet, which isn’t helping either. All in all, I’m pretty upset with the situation. I think the absence of an API is really hurting them too. Look at Twitter, An entire ecosystem has sprouted around it. While I do like Plurk's horizontal timeline, not everyone does. The customization options are really limited an the Karma system really is annoying. It laso gets very boring after some time. Smileys and badges could only take it so far.